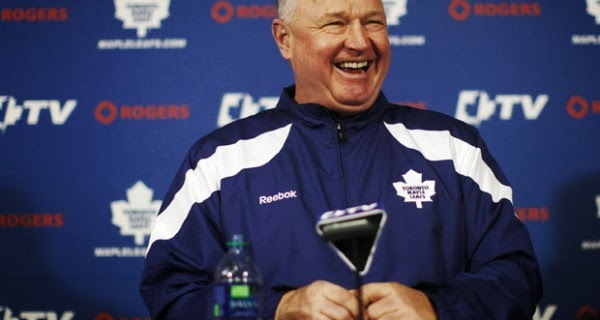 Could the Leafs Fire Randy Carlyle? | Five Minutes For Fighting Five Minutes For Fighting: Could the Leafs Fire Randy Carlyle? In early December the Sun's Steve Simmons took Carlyle to task for a lack of trust in his younger players, and his stubborn reliance on playing a short bench. Morgan Rielly out. Jake Gardiner back in. Mark Fraser still playing. Randy Carlyle is beginning to confound me. It isn't only the losing that is making Carlyle look bad, it's how badly the Leafs are losing. The scores are often close, but that's largely thanks to the goalies playing incredibly. Without James Reimer or Jonathan Bernier imitating vintage Curtis Joseph the Leafs would be getting blasted, and looking more like a lottery team. To make matters worse for Carlyle, some of the players who spent last year in his dog house and were essentially run out of town by their coach, namely Mikhail Grabovski and Clarke MacArthur, have been great in their new locales. Combined, the duo have 51 points in 62 games. That Bobby Ryan guy who Carlyle had it out for in Anaheim is doing pretty well too, on pace for another ho-hum 35-goal season. The Ducks don't seem to miss Carlyle either—amassing a 79-41-19 record since his dismissal, or 104 points over an 82-game season. With only two regulation wins in their last 19 games (and only six wins total), and a brutal schedule in December, it is no longer inconceivable that Carlyle could be fired. Tim Leiweke seems like a pretty emotional guy, and I wonder if the added exposure from HBO's 24/7 gives him a reason to can Carlyle (and by that I mean force Dave Nonis) if a tailspin occurs. And for Nonis' part, he definitely has a firing in him. Carlyle wasn't his hire, and from watching Brian Burke in Toronto he saw what can happen when a general manager waits a little too long to get rid of a coach who clearly isn't working out. There also could be some underlying tension between Carlyle and Nonis. After watching newly acquired Peter Holland sit benched or play a pointless five minutes a night in most games after Nonis went out and made a shrewd acquisition, Nonis needed to step in and put Jarred Smithson on waivers to get the superior player in the lineup. Carlyle also has been inexplicably benching Rielly, to the point that Nonis might now be considering loaning the talented rearguard to Canada for the World Junior Championships, something he once called "unlikely". The injuries the Leafs have sustained might save Carlyle, however. Losing Dave Bolland long-term, as well as Tyler Bozak, the No. 1 centre (in name only), and Joffrey Lupul, plus the rash of suspensions, has left the Leafs short-handed for most of the season. It's an excuse to keep Carlyle, but not really a good one. Bolland was great to start the season, but he's a checking third-line centre; Bozak is a second-line centre at best; and Joffrey Lupul is always hurt, so his absence, at least for part of the year, should be expected. It's not as if the Leafs lost Phil Kessel and Dion Phaneuf for months. The injuries the Leafs have had to suffer through are the type teams should be able to soldier through (Carlyle, to his credit, hasn't used the injuries as an excuse and directly told the media not to use them as one). With each mounting loss, and the Leafs slipping out of the playoff picture becoming a reality, Carlyle's clock starts ticking a little faster. Prediction: Leafs losing streak is endless and they get embarrassed at the Winter Classic. Carlyle fired the next day.